NanoLumens put its design abilities to the test when they were tasked with designing a visually powerful display solution for Acuity Insurance’s new campus theater. Incorporating jumbotron sized video walls into the new 2,000-seat theater posed a serious challenge because the two-level theater is circular and the seats are installed in a vertical manner in a 65-foot radius from the stage. 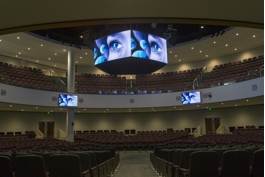 Acuity required a display solution that would enable every seat in the theater to have a clear view of the stage no matter where the seat was located. In addition, the total weight of the solution had to fall below a certain limit in order to conform to the architecture of the building ceiling. NanoLumens was brought into the equation by Acoustics by Design, the company responsible for developing the new theater’s entire advanced audiovisual system, and Camera Corner Connecting Point, the company responsible for installing whatever display solution was selected. After selecting LED technology as the way to go, Acuity, Acoustics by Design and Camera Corner Connecting Point selected NanoLumens. The solution created by NanoLumens is a five-sided pentagon 3mm NanoSlim LED display solution. Each of the five curved displays measures 10’H X 6.5’W and is joined together to create a single pentagon shaped structure that hangs suspended from the ceiling over the theater’s central stage. The pentagon measures 16’ across the center and weighs a total of 3,600 pounds, including the winch. The calculated weight of the displays is only 1,900 pounds. “We had a very specific weight limit that we had to stay under when designing the display solution,” said Scott Tomashek, Camera Corner Audio Visual Systems Consultant. “The NanoLumens team demonstrated their value by creating a superior solution that came in under the maximum weight limit." As critical as the NanoLumens LED displays are to the new theater’s success, a 10 Danley speaker sound system with one large subwoofer and a six-camera video system to track speakers from every angle complete the technology package. According to NanoLumens Regional Sales Manager Ryan Wilhelm, the success of the project is a credit to every member of the team, each of whom contributed their very best ideas to design a solution that delivers an unprecedented visual impact in a structure that weighs less than the maximum weight restriction.